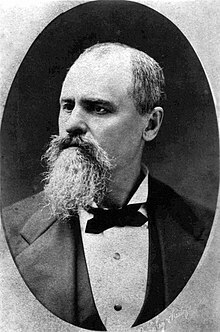 Benjamin Holladay (October 14, 1819 – July 8, 1887) was an American transportation businessman responsible for creating the Overland Stage to California during the height of the 1849 California Gold Rush. Ben Holladay created a stagecoach empire and he is known in history as the "Stagecoach King". A native of Kentucky, he also was hired as a private courier to General Alexander Doniphan of Missouri. Doniphan refused point-blank to carry out orders to kill the Mormons during the 1838 Mormon War in Missouri. Through Holladay's friendship with Brigham Young, Holladay established a profitable freighting contract to Salt Lake City. His transportation empire later included steamships and railroads in Oregon. Holladay was born October 14, 1819, in Nicholas County, Kentucky. His father, William Holladay (born in what is now Spotsylvania County, Virginia) was a third-generation American, descended from John "The Ranger" Holladay. William migrated to Bourbon County, Kentucky, where he was a guide for wagon trains through the Cumberland Gap. Benjamin's mother was Margaret "Peggy" Hughes. Benjamin Holladay learned the freight business at an early age and left home in his late teens for a road trip to Santa Fe in what was then Mexico. He then settled in Weston, Missouri, where he worked as a store clerk before serving as courier during the 1838 Mormon War for the state militia. After working at the store for a few years he opened a tavern and hotel in 1840, as well as starting what would become the McCormick Distilling Company, which claims to be the oldest distillery still operating in the same location. Business boomed with his supplies for General Stephen Watts Kearney during the Mexican–American War. Holladay moved to California in 1852 where he was to operate 2,670 miles (4,300 km) of stage lines. Holladay acquired the Pony Express in 1862 after it failed to garner a postal contract for its owners, Russell, Majors and Waddell. In 1861 he won a postal contract for mail service to Salt Lake City, Utah, and established the Overland Stage Route along the Overland Trail to avoid confrontations with American Indians on the northern Oregon Trail and Pony Express routes. He added significant infrastructure along the trail, including Rattlesnake Station. Traveling to New York from San Francisco in July, 1862 Holladay was almost killed when the SS Golden Gate sank off Manzanillo. Between the Overland Trail and six other routes, Holladay received government subsidies totaling nearly $6 million over a four-year period. Holladay sold his stage routes to Wells Fargo Express in 1866 for $1.5 million. In August 1868, Holladay moved to Oregon, where he had organized the construction of a railroad along the Willamette River, purchasing the illegally incorporated Oregon Central Railroad of Salem, turning it into the Oregon and California Railroad Company. In April 1868, construction started on lines along both the sides of the river. Holladay's "Eastsiders" completed 20 miles (32 km) of track before the competition, using "every trick known to man" in the construction, including bribing the Oregon Legislature in October 1868. The competition subsequently sold out to him in 1870. Holladay financed the operation via German bankers, who bought $6.4 million of bonds (out of a total $10.95 million). He won a federal subsidy and built the Oregon and California Railroad as far south as Roseburg, as well as controlling the Willamette River commerce through the Portland Dock and Warehouse Company, the Oregon Transfer Company, and the Oregon Steamship Company. 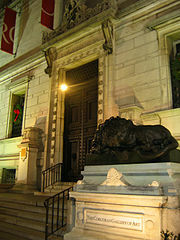 The Panic of 1873 financial crisis stopped the effort. Holladay lost most of his fortune in the stock market collapse on September 18, 1873. In 1874, Henry Villard was sent by Holladay's German investors when he was behind on bond interest payments. In 1876, Villard took over the railroad. Ben Holladay died in Portland, Oregon, on July 8, 1887, and is buried at Mount Calvary Cemetery in that city. Villard described Holladay as "illiterate, coarse, boastful, false, and cunning." Holladay's attorney, John Doniphan, described him as possessing "many of the characteristics of Napoleon." He was known for having "the bearing of one born to command", and for "being clever, shrewd, cunning, illiterate, coarse, and completely unscrupulous".Joseph Gaston described him as being "wholly destitute of fixed principles of honesty, morality, or common decency." After buying a large home from Doctor Rodney Glisan, "he remodelled it and immediately installed a harem of high class prostitutes." Holladay and his wife had two daughters who married members of European nobility the Count de Pourtales and Baron de Bussiere. Mrs de Pourtales died young leaving their child to be raised by her father, Count de Pourtales and her grandparents. The city passed an ordinance on June 1, 1889 renaming Holladay Street to Market Street, a tongue in cheek reference to the activities that took place there. This brought much concern to the residents on Market in the more respectable areas to the north. In September 1899, the city changed the name of Market Street north of 23rd to Walnut. ^ a b Allen, Cain. Holladay built W. Oregon railroad. Portland Business Journal, December 31, 2004. ^ Sinking of the SS Golden Gate, mooneyevents.com; accessed June 11, 2017. ^ "Chapel". Thoren Restorations. Retrieved 2017-06-11. ^ a b c d e f g h i j MacColl, E. Kimbark (November 1976). The Shaping of a City: Business and politics in Portland, Oregon 1885 to 1915. Portland, Oregon: The Georgian Press Company. OCLC 2645815. ^ a b "Ben Holladay, Stagecoach King, Butterfield Overland Dispatch". Linecamp.com. 1999. Retrieved 2017-06-11. ^ "Formerly "McGaa" st changed by ordinance". Rocky Mountain News. June 1, 1866. ^ "Will weed sin from respectable localities". The Denver Times. July 23, 1889. ^ "Untitled". The Rocky Mountain News. September 19, 1899. ^ "Untitled". The Denver Times. September 19, 1899.